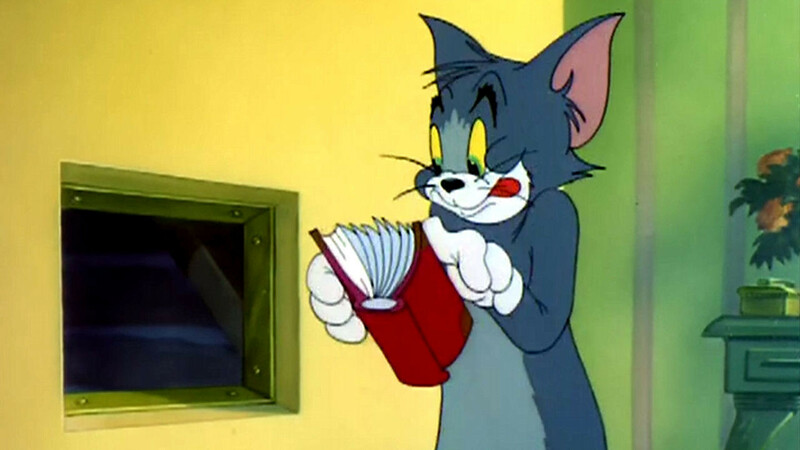 Jerry’s Diary’ is Tom and Jerry’s first compilation cartoon. However, Hanna & Barbera even make this cheap form of cartoon making upper class: ‘Jerry’s Diary’ contains lots of original footage and has a surprisingly good story of its own. Only after 1’56 the compilation starts, to end one and a half minute before the cartoon ends itself. In the encompassing story an anthropomorphized radio tells Tom that it’s ‘be kind to animals week’, so Tom is persuaded to give Jerry little gifts. He knocks on Jerry’s door, carrying flowers, a box of sweets and a pie. Jerry’s not in, however, and inside his home Tom discovers Jerry’s diary, which he can’t resist reading. Enter the compilation, which features scenes from ‘Tee for Two’ (1945), ‘Mouse Trouble’ (1944), ‘Kitty Foiled‘ (1948) and ‘Yankee Doodle Mouse‘ (1943). Tom gets so annoyed reading this stuff that, when Jerry finally does show up, he throws the pie at him, smearing him against the wall and leaving the little mouse in complete bewilderment. After this cartoon, four other compilations would follow, up to their very last year of theatrical cartoons, 1967. However, none of these would reach the high standard of ‘Jerry’s Diary’.